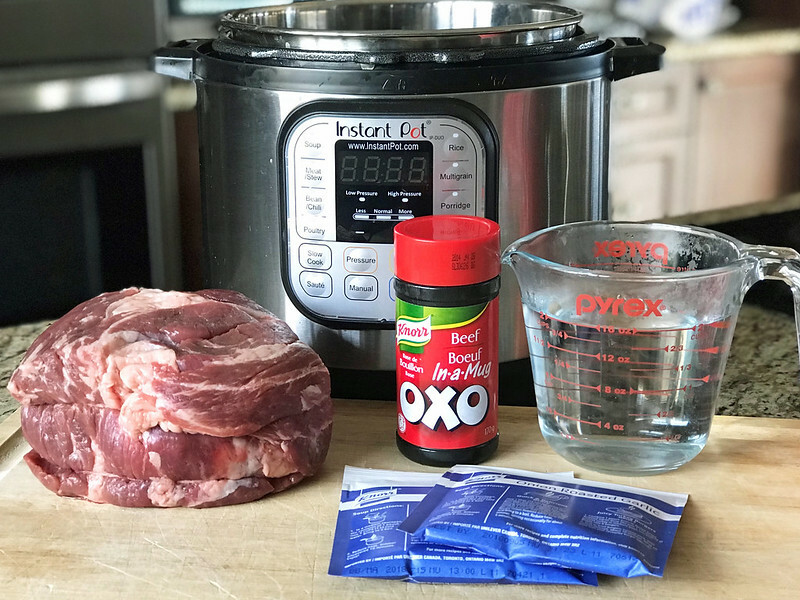 The Best Instant Pot Roast You’ll Ever Eat! Once upon a time I could make a melt-in-your-mouth roast in my slow cooker. I don’t know what changed, but it just doesn’t happen for me anymore. How you overcook something in a slow cooker, I’m not sure…but they always came out dry and stringy for me. 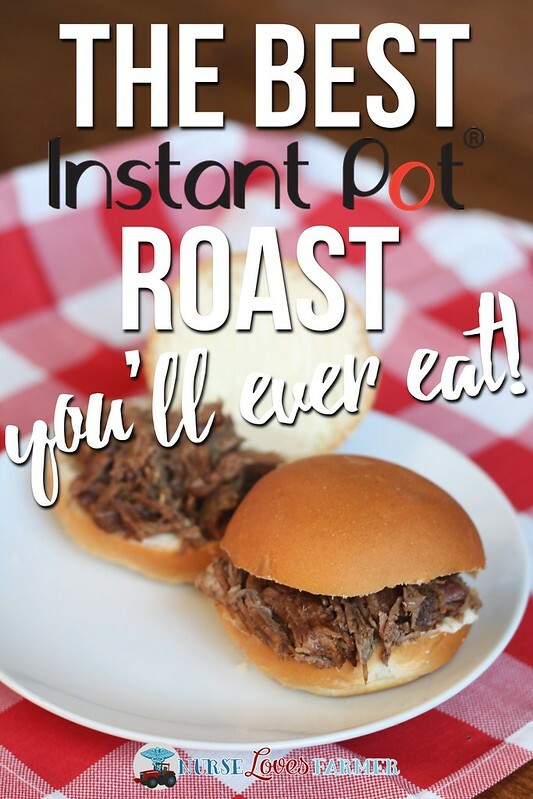 I have long craved that moist, melt-in-your-mouth roast and I was hopeful for when I first got my Instant Pot, but it was definitely a trial and error situation. I bought a cheap oven round roast from the local small grocery store assuming that a pressure cooker could turn any cut of meat into tender deliciousness. I was wrong! After doing a lot of reading and ‘research’ from other food bloggers, I have found that it’s all in the cut of the roast, which I had really not paid much attention to previously. You need to look for and buy a chuck or blade roast, this is non-negotiable, or this recipe won’t turn out. I’ve even tried a cross-rib roast, because our grocer wasn’t carrying chuck or blade at the time, and it’s still just not the same. Cut your roast into quarters and place into Instant Pot. Pour beef broth over meat and sprinkle soup mixes over meat too. 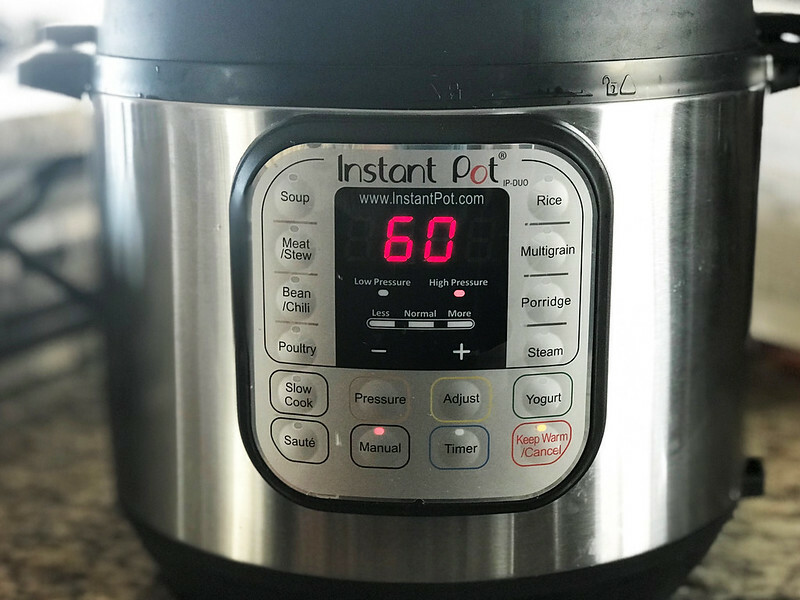 Make sure your Instant Pot valve is set to seal, lock on the lid, and set to “Manual” on high for 60 minutes, and allow a full, natural pressure release, which takes about 25-30 minutes or so. When the pressure is released, open the lid and shred meat to desired consistency. You can certainly serve this as a main course with mashed potatoes and a veggie, but I love most to have it on a soft tray bun or dinner roll for the most delicious beef on a bun. You can use the juices as your au jus to dip in or eat as you desire. 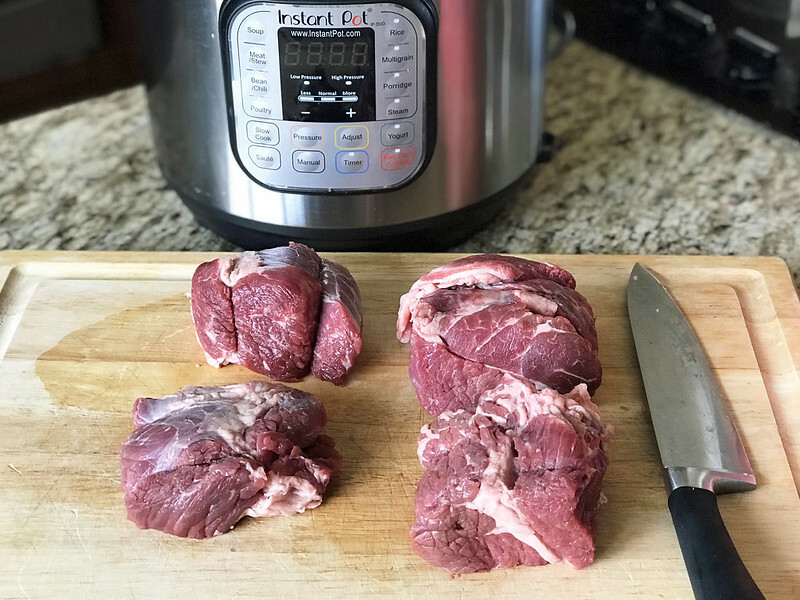 The best Instant Pot roast you'll ever eat! 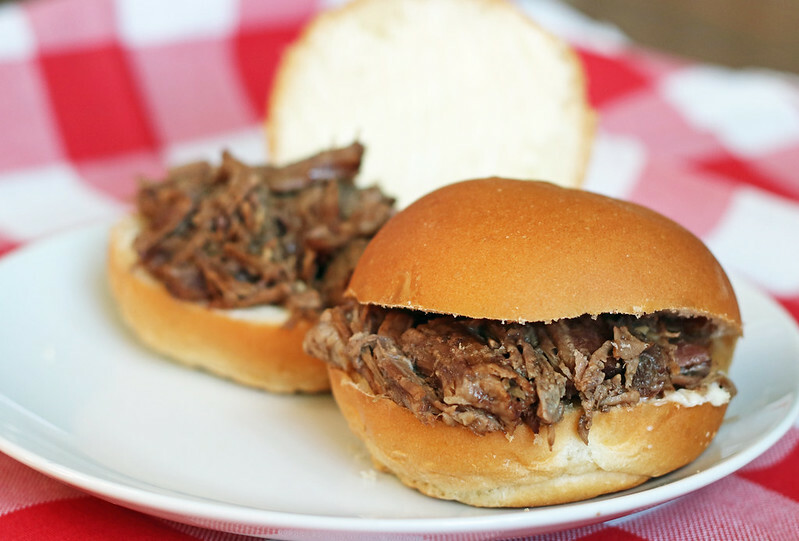 Melt-in-your-mouth meat that you can serve as a main course or shred finely for amazing beef dip sandwiches. Cut your roast into quarters and place into Instant Pot. 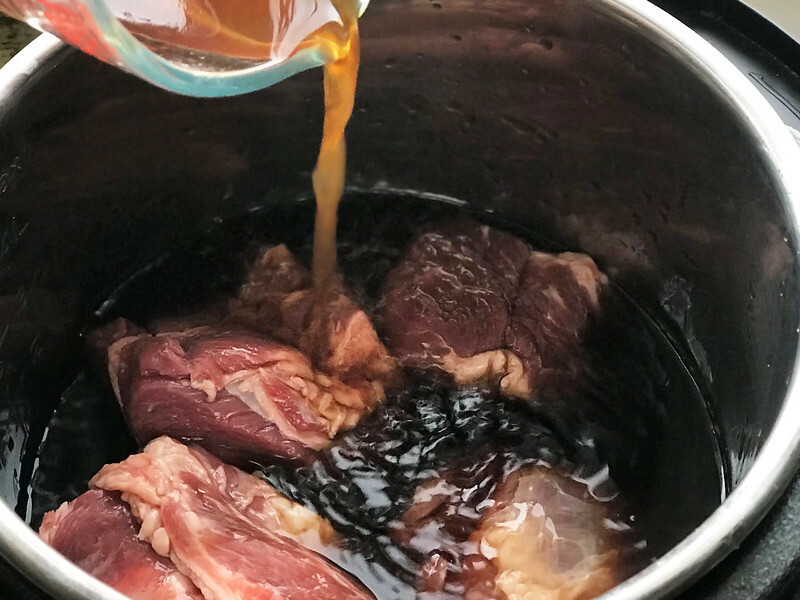 Pour beef broth over meat and sprinkle soup mixes over meat. Make sure your Instant Pot valve is set to seal, lock on lid, and set to "Manual" on high for 60 minutes. Allow a full, natural pressure release, which takes about 25-30 minutes or so. When the pressure is released, open the lid and shred meat to desired consistency and serve. Total time from start to finish is under 2 hours: 5 minute prep, 10-15 minutes to build up pressure, 60 minutes to cook, 25-30 minutes for natural release pressure. If you cook a larger 5-7 lb roast, I would add 10 minutes of extra cooking time. It is not advisable to use other cuts of meat for this recipe. 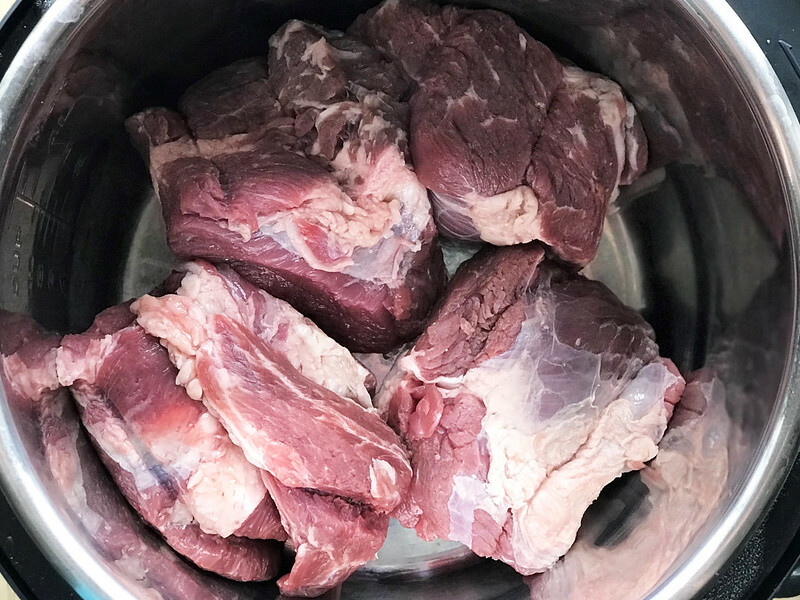 I have tried other recipes that state you need to cook for a longer time to break down the fibres of these tougher cuts of meat, but I have used 60 minutes on a 2-4 lb size chuck or blade roast and it works every single time (I cannot speak to other cuts of meat). If you need to cook larger chuck or blade roasts, I’d add 10 minutes to a 5-7 lb roast. This is a great make ahead meal and one that can serve many guests! This is a very bare-bones recipe, you can certainly add other spices or peppers to the pot and fix up a much fancier beef dip sandwich, but this is simple…and sometimes we just need simple in our lives! « Jonathan is 18 Months Old! Hi Donna, sorry I don’t check my comments often, I have done bigger roasts and just adjust the time by 10 mins or so. Saving this recipe for when my Instant Pot arrives!